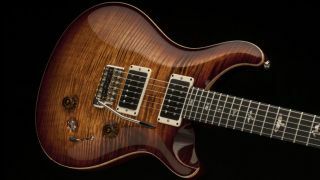 Every year, PRS's Stevensville factory opens its doors to host the Experience PRS event, and 2016's festivities have been commemorated by the highly limited-edition Experience PRS 2016 Custom 24-08. The 08 in the model name signals the eight pickup combinations that are onboard this bells-and-whistles take on the classic Custom 24 - two mini-toggle coil-split switches and a three-way selector control the 85/15 Multi-Tap pickups, offering a full array of humbucker and single-coil sounds. As you'd expect from PRS, top-quality tonewoods abound throughout, with a carved figure maple 10 top on mahogany body, while the mahogany Pattern Regular neck and Gaboon ebony fingerboard are topped off by an ebony headstock veneer with 'Pre-Factory' Small Eagle motif - only found on Experience PRS limited runs. Only 50 of these guitars will be made in five finishes: Aquamarine, Charcoal, Copperhead Burst, Trampas Green, and Slate Blue. There's no word on pricing yet, but rest assured, it won't come cheap.